We can email a drawing file to somebody maybe across country even. So that they could see the plans, they could markup and send back to us. DWGSee creates overlays for markups, so that all the markups made by others will not infect the original drawing file. 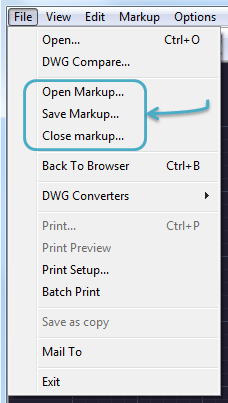 Markup overlays are saved in a separate *.MRK file. To save the bandwidth or email attachment size, the reviewer can just send back the *.MRK file and you can easily load it on your drawing in DWGSee to see the remarks. In DWGSee, measure and markup tools are stored in the markup menu category. So that either it is a measurement or markup on screen, they will all be stored in a same *.MRK file once you clicked the “Save Markup” button. The Measure tool measures the distance between two points, takes the angle between two non-parallel lines or calculates the radius of a circle, an arc, a curve or an arch. Instead of showing the results on information panel, to add the measurements as markups on the drawing, you will need to choose the following tools on the navigation bar. To attract more attentions, you can add callout markups. The Callout tool enables you to create a call-out shape that points to a particular location in the drawing. You can enter text in the call-out box to explain the call-out. You also have the option to use free-form drawing markup tools that are meant to simulate actually drawing on paper. The drawing markups are divided into three different types: Free Redline markup, Polyline markup and Rectangle markup.